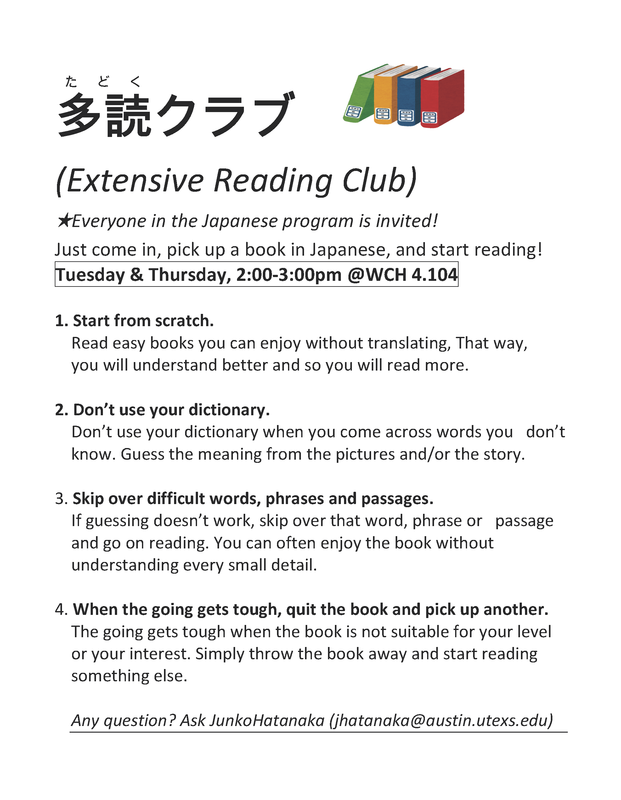 ★Everyone in the Japanese program is invited! Just come in, pick up a book in Japanese, and start reading! 1. Start from scratch. Read easy books you can enjoy without translating, That way, you will understand better and so you will read more. 2. Don’t use your dictionary. Don’t use your dictionary when you come across words you don’t know. Guess the meaning from the pictures and/or the story. 3. Skip over difficult words, phrases and passages. If guessing doesn’t work, skip over that word, phrase or passage and go on reading. You can often enjoy the book without understanding every small detail. 4. When the going gets tough, quit the book and pick up another. The going gets tough when the book is not suitable for your level or your interest. Simply throw the book away and start reading something else.